Doha (VNA) – National Assembly Chairwoman Nguyen Thi Kim Ngan has stated that Vietnam wants to promote substantial development of cooperation with Georgia for the benefit of both sides. During a meeting with Chairman of the Parliament of Georgia Irakli Kobakhidze on the sidelines of the 140th Assembly of the Inter-Parliamentary Union (IPU-140) in Doha, the capital city of Qatar on April 7, NA Chairwoman Ngan said Vietnam always bears in mind the valuable support of international friends, including Georgian people, during the national liberation and reunification. 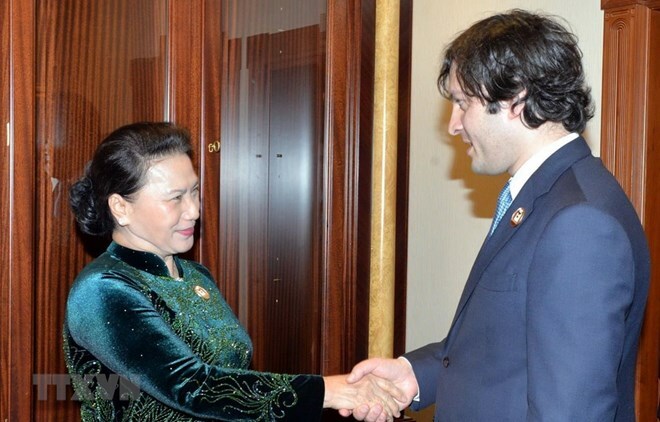 Congratulating Georgia on its economic achievements over the past years, she wished that Vietnam and Georgia would develop multi-faceted collaboration, especially in economy. Ngan shared the Georgian Parliament Chairman’s view that two-way trade remains modest compared to the two countries’ potential, and urged that both sides would prioritise developing economic and trade links. The NA leader said Vietnam exports large volumes of apparel, footwear, coffee, cashew nuts, mobile phones, and electronic spare parts, which are in demand in Georgia. She hoped that the country will make it easier for Vietnamese goods to enter its market. The top Vietnamese legislator welcomed Georgia’s plan to open its embassy in Hanoi, expressing her belief that the embassy will help further promote bilateral ties in a wide range of areas. She suggested that both sides should facilitate the exchange of all-level visits and mutual support at multilateral cooperation forums, especially at the United Nations, maintain political consultation between the two nations, enhance people-to-people exchange to raise mutual understanding and build trust for the development of the region and the world. Vietnam is ready to serve as a bridge and a gateway for Georgia to enter Southeast Asian countries – a vibrant market with a population of over 600 million people, she said. Kobakhidze, for his part, said the Georgian embassy opening in Hanoi is scheduled for the late 2019. He said as a country linking Asia and Europe, Georgia wants to boost economic ties with Vietnam, adding that Georgia is stepping up an open economy on the back of a number of free trade agreements with countries and the region, including the European Union, Turkey, neighbouring countries and China. He proposed that the two sides enhance trade and continue facilitating exchanges between the two legislatures, their committees, parliamentarians and friendship organisations. The establishment of friendship parliamentarians’ groups and promotion of their exchanges will play an important role in bolstering parliamentary ties, he said, adding that Georgia welcomes parliamentary cooperation in all forms with Vietnam. Noting that the number of Georgian tourists going to Vietnam doubled last year, he said it is a positive signal in people-to-people exchange. The Chairman suggested making use of multilateral mechanisms to reinforce bilateral ties as well as sharing reform experience to advance mutually-beneficial relations.